Some birthdays are more special than others, as we all might agree. 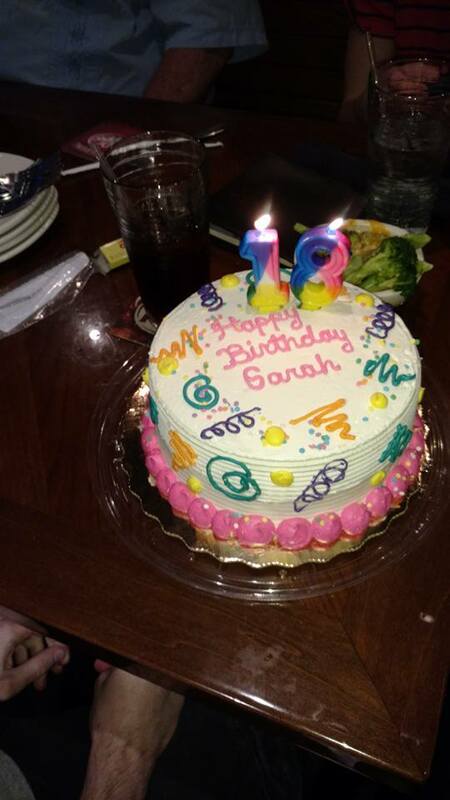 Sarah, my oldest granddaughter, turned 18 this year on March 3. 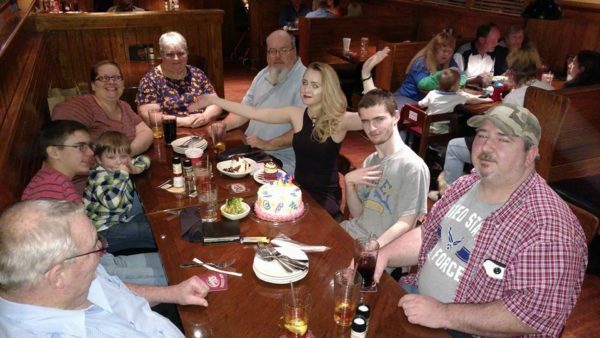 Her Dad, my son Seth, decided to take the family out to Outback Steakhouse to celebrate. We had a ton of fun, lots of good food, and just about as much hugging and loving. 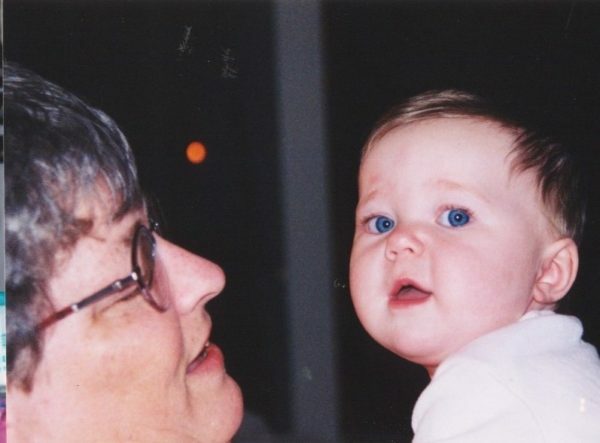 The first time we met was when she was 10 months old. 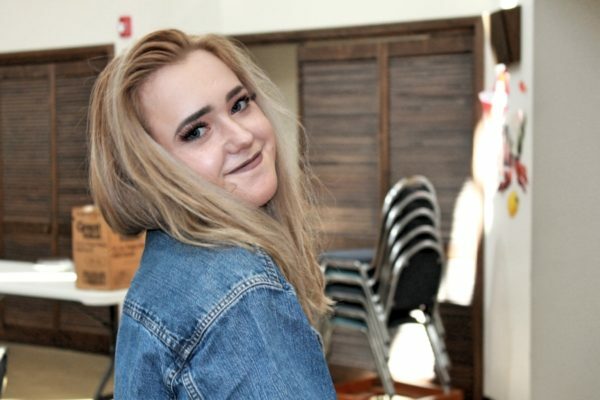 Sarah was born in Guam, where her Dad was stationed with the Air Force at the time. We met when she was 10 months old, when she was traveling from Guam to England by way of Georgia. She was a beauty then, don’t you think? In 2002, Sarah and her family came to visit in Georgia. The next time we saw her, Sarah was 4. We all went up to Dahlonega to spend a few days in a cabin in the mountains. 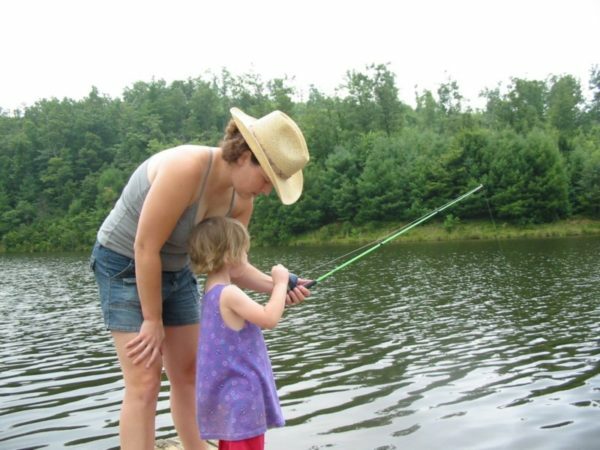 Aunt Becca took her fishing at the lake. Sarah has always been Poppa’s girl. She has always been happy to see him. 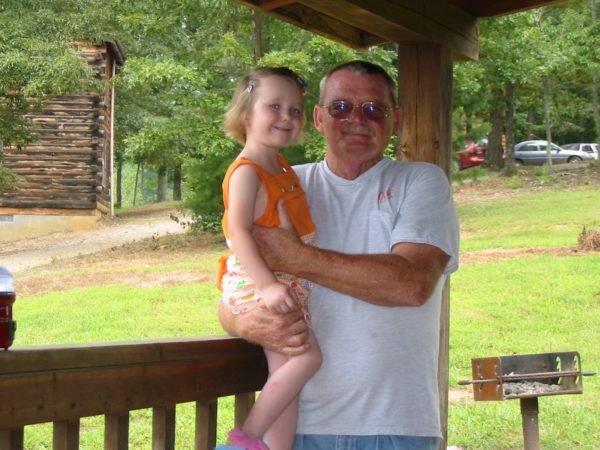 In 2005, Sarah came to spend the night with Fabgrandpa and me at our RV when we worked at Stone Mountain Park. In 2005, Sarah was living with her mother in Tennessee. 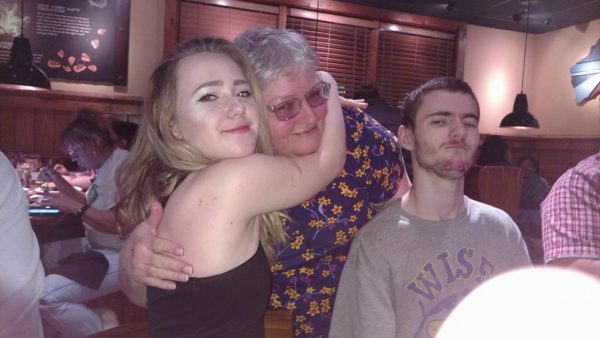 They came to Georgia at Christmas to spend the holidays with her maternal grandparents house. She came to spend one night with us at Stone Mountain Park, where we were working. 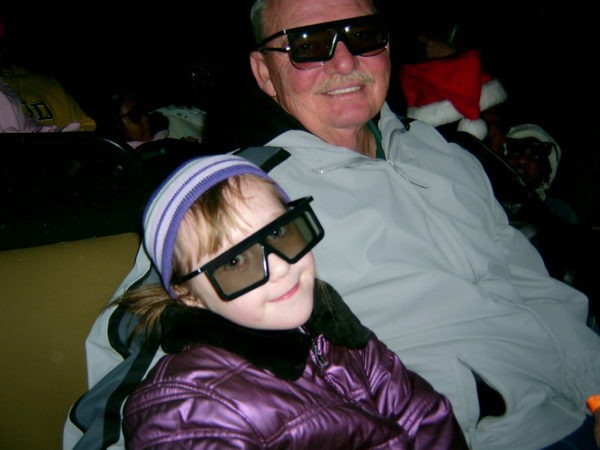 We took her to the 4-D theater to see the special Christmas movie that was playing there, where we all had to wear the 4-D glasses. In 2016 Sarah and her little sister, Amelia, took this photo for Instagram. 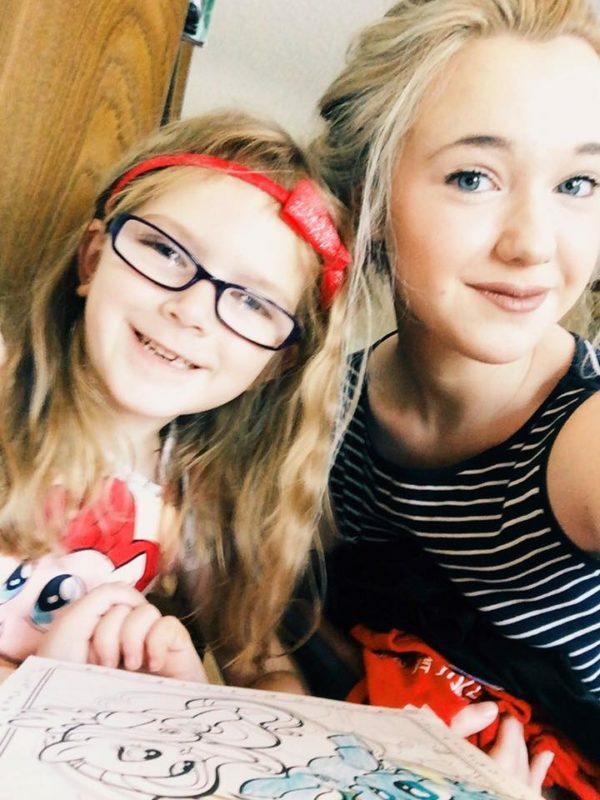 This was a selfie that Sarah took of her and her little sister Amelia some time last year. love this photo of Sarah. It is so playful and cute. 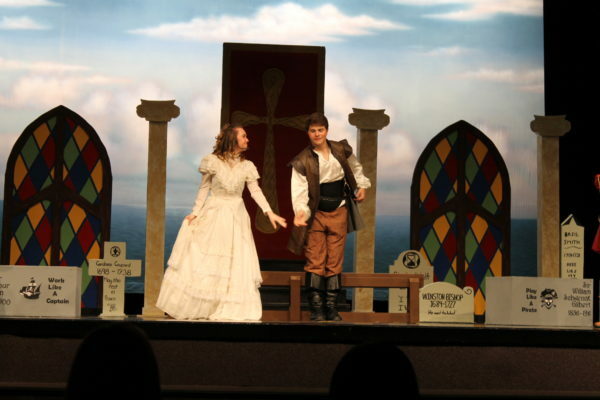 Sarah played the lead part of Mable in the school play, The Pirates of Penzance, last year. That girl can sing! At our family reunion last October. Sarah took photos of everyone at our family reunion last year in October. This the only photo of her that was taken! 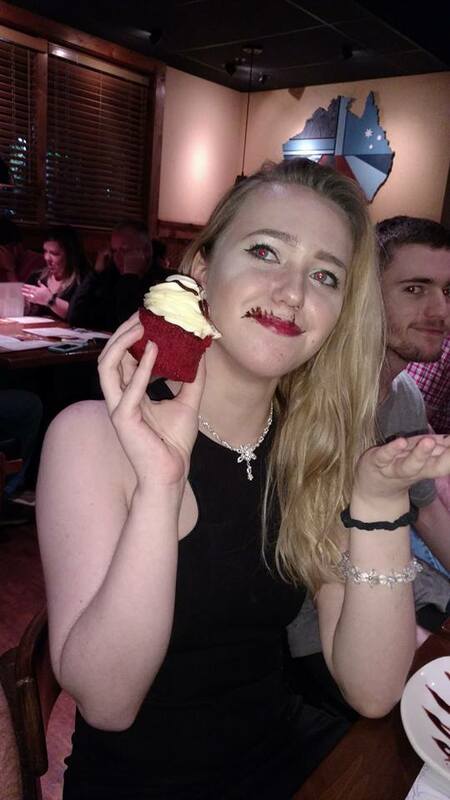 She bit into her birthday cupcake, and got a chocolate mustache. At her birthday party last Friday, Sarah bit into her birthday cupcake, and got a chocolate mustache. That led to everyone at the table, including me, getting a frosting mustache. She is not afraid to hug me in public. Sarah doesn’t hesitate to hug me in public. 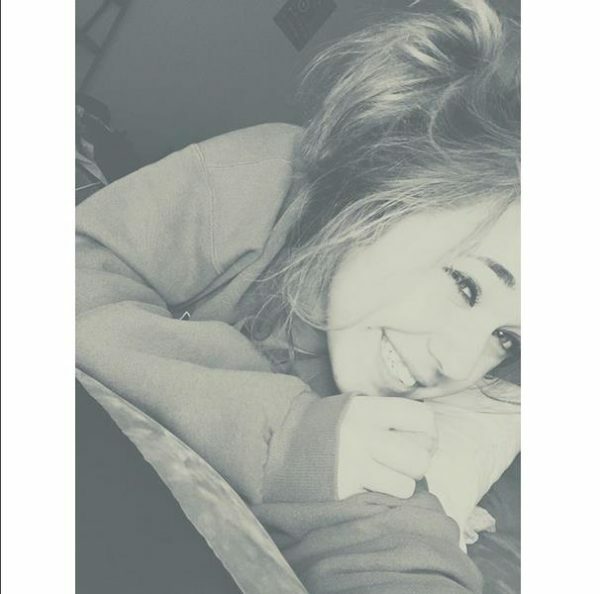 I love that about her. If you look closely, you will be able to see Michael’s pink frosting mustache and beard. Aunt Emily brought the birthday cake. Aunt Emily brought the birthday cake. It was a really good cake. The whole Douglasville family was there. The whole Douglasville family was there. We were missing Aunt Becky and Uncle Rafe who live in East Cobb, and Aunt Becca and Uncle Ken, who are living in Denver. We all had a lot of fun! The Outback staff came out and sang Happy Birthday, and we all sang along with them. It was just a fun, fun evening. What a great tribute to your granddaughter turning 18. They do grow up fast. Great going down memory lane. Thanks for linking up with Blogging Grandmothers.